G.I. Joe wants you to punch The Enemy! Vintage3DJoes.com is the only interactive, three dimensional museum of the original run of GI Joe, from 1964 to 1976. 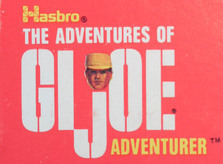 The site provides interactive spins and reference material for everything Hasbro produced during the 12" era of "America's Movable Fighting Man," "The Adventures of GI Joe," and "The Adventure Team." Navigate through your favorite eras using the tabs at the top of the page or the buttons below. As the site develops, more sets will be available to browse. If you're looking for a specific set, use the search feature above. Welcome to all GI Joe fans! Just a quick reminder that all images on the site are copyrighted and there is to be no use of any image from the site for commercial or reproduction purposes without specific written consent. Please credit the site in any informal use of an image. This archive takes many hours of work and is offered free of charge for informational purposes only. If you would like to to help support the hosting fees for the site and the 3D spins, please consider making a donation here. Click on a button or image below to start your adventure with G.I. Joe! NEW: 1/1/18 Happy New Year from Vintage3DJoes! I have done a bit of reorganizing, so check the tabs up top to find your favorite pages. Lots of new Backyard Patrol items, Inflatables, Games, Costumes, and Arts & Crafts! 5/4/17 A new page dedicated to the Overstock Backyard Patrol sets. ​7/16 The Dietz Archive of GI Joe Commercials is open for all to see. The videos play best if you are using Chrome as your browser. 6/7/16 The Dietz Archive of GI Joe Commercials will be available to donors shortly, and debut to the public at the 2016 JoeCon in Loveland, CO on June 18. They will be available to all a few weeks later! 8/16/15 Finally! Completed sections on kid-sized & licensed items. Games, activity books, records, Viewmaster and so much more! As of this writing (8/11/14) Vintage3DJoes.com has posted an example of each GI Joe set produced between 1964-76. The process took a full year, and has been a blast. The next year will be spent indexing, adding detail pages and photos, as well as tracking down images of the remaining packaged items not depicted. If you have an example of a packaged item not displayed that you would be willing to share, please contact me! A full list of images needed is posted here. Mistakes and typos are inevitable in a project this large, and the site should be as accurate as it can be, so I'm eager to hear your feedback. If you have some information to correct an error on the site please visit this page for information. If there are images you would like to see, or questions you need to have answered about the site, contact me. Already exhausted Vintage3DJoes.com? Drive on over to our sister site, 3DJoes.com for 3.75" G.I. Joe nostalgia, or step into space adventure at 3DSuperJoes.com! Your host, circa 1972. The best Christmas ever!